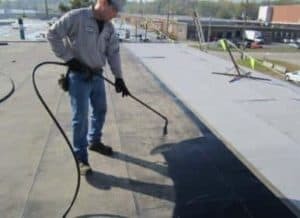 As a building owner or facility manager, you have decided on a new, or replacement, roof and you understand that you need the redundant long-term weatherproofing protection that a multiply asphalt roof can provide. Now you must decide on the particular method of installation that best suits your situation. This article will walk you through the various options for installing a durable and reliable low-slope asphalt roofing system. 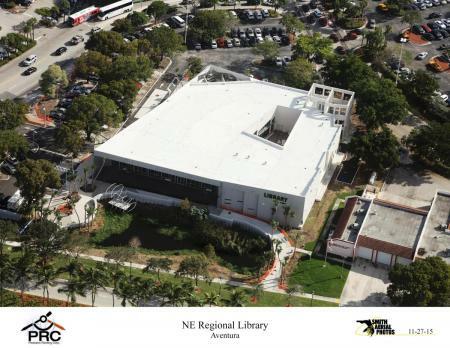 Asphaltic roofing systems offer tough redundant weatherproofing protection combined with tremendous versatility in performance characteristics and installation methods. Both modified bitumen and built-up roofing (BUR) systems offer installation options that can accommodate the challenges posed to any property owner. The combination of membrane technology and design and installation technique goes hand-in-hand, and together they play an important part in your choice of the right roofing system for your property. With some basic information about the budget, the building’s construction, when your new roof will be installed and how the installation of a new roof may impact the occupants of your building, you can begin narrowing your choices. Most manufacturers offer systems that use cold adhesives to adhere modified bitumen roof membranes and construct built-up roof membranes (BUR). Cold adhesives generally fall into one of two categories; solvent-based “cutback” adhesives or asphalt extended polymeric adhesives. Cutback adhesives are available to meet federal, state and local VOC requirements. Asphalt extended polymeric adhesives also meet VOC requirements and may provide a good low odor solution if needed. Certain types of these adhesives may be used directly over occupied spaces with no special ventilation or air handling requirements. Cold adhesive applied roof systems may be installed using rollers, sprayers or squeegees. Cold adhesive applications require less equipment than traditional hot BUR applications that utilize kettles to heat the asphalt; there is no kettle, tanker, hot piping, or mop carts. Where spray-applied systems aren’t practical, cold adhesive systems may also be installed by pouring the product directly from buckets and applied using notched squeegees, or sometimes rollers, allowing the adhesive to be spread in a uniform thickness. The membrane may be rolled into place, or “flown-in” or “floated” in place, followed by brooming or rolling the membrane to help ensure proper adhesion. When spray application of cold adhesive is an option, consideration for equipment staging, potential work/occupant disruption, and overspray precautions should be part of the decision-making process. Installers who own spray equipment generally have experience in the installation of these systems and should be consulted prior to work commencing. Weather conditions at the time of application play an important role with any roof membrane type; including cold adhesive applied asphalt applications. When determining if cold adhesive systems are appropriate for your new roof, keep in mind that they may be installed in a wide range of environmental conditions when appropriate steps are taken. Most manufacturers recommend minimum temperatures of 45 degrees to 50 degrees Fahrenheit and rising during application, but many also recommend keeping the adhesive temperature minimum near 70 F to help ensure proper application rates. Hot air-welding of overlaps is also an option to extend the application window in less than ideal conditions. Heat welding is one of the original installation methods for modified bitumen systems. 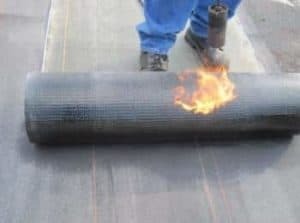 Both atactic polypropylene (APP) and styrene-butadiene styrene (SBS) formulations of modified bitumen membranes may be installed by heat welding; either by open flame using a specialized propane roofing torch or using a hot air welding machine. Most modified membranes are specially manufactured for torch or heat-welding application. These products are usually thicker than those designed to be adhered with the cold adhesive or hot asphalt. When properly installed, the application of heat from either a torch or heat welder melts the asphalt surfacing compound, creating a fluid adhesive that cools and bonds to substrate. When two layers of sheet material are heat welded, they are fused together forming a monolithic membrane. The heat applied at the point of installation also helps to ensure adequate asphalt temperatures are maintained, making torch-applied systems a great option for year round installations. Torch-applied systems require separator sheets (e.g., an asphaltic base sheet) when used over combustible substrates. In addition, local building codes may have requirements (for example CERTA trained applicators) that specifically address safety aspects of torch installations. Electric hot air welders use hot air to melt the asphalt compound and are typically used to weld the overlap or seam. Hot air welded seams are generally used in conjunction with either cold adhesive applied or mechanically fastened modified bitumen membranes. Specialized equipment, however, does exist for full width welding of modified bituminous sheets without open flame. Roofing torches and hot air welders are also often used for finishing details. Self-adhesive modified bitumen membranes use specialized formulations that incorporate certain resins and polymers in the manufacturing process that transform the bitumen into a true adhesive. This “self-adhesive” bitumen layer requires the use of removable release liners to prevent the product from sticking to itself in storage and prior to installation. During and after application, the adhesives generally require minimum temperatures of 45 degrees Fahrenheit to 50 degrees Fahrenheit and rising to help ensure adhesion to the substrate. Self-adhesive membranes have become increasingly popular because of their versatility. The installation process uses materials commonly used in all roofing applications such as brooms and rollers to press the membrane into place and to help ensure adhesion to the substrate. These products can be used in the construction of self-adhering modified bitumen membrane systems or incorporated as vapor retarders or interplies in other multiply asphaltic or synthetic roof systems. Hot asphalt is a reliable and durable method of installation. Whether you are installing a 2-ply modified bitumen system, multi-ply BUR system, or a hybrid system consisting of BUR plies and a modified cap sheet, installations incorporating hot asphalt use the same equipment. Installing roofing materials in hot asphalt requires the presence of on-site kettles and oftentimes pumping equipment. Hot asphalt is most commonly pumped to the rooftop and carted to the point of application. Roofers spread the asphalt, and unroll and broom-in reinforcing membranes (BUR plies) in the hot asphalt. While many factors influence a proper installation, the amount of asphalt and its temperature at the point of application stand out as key elements for a hot asphalt installation. BUR systems also are a great option for year round installations. Several factors influence whether a hot asphalt installation is right for your building. For instance, pumping asphalt to a high-rise apartment building in an urban area isn’t always practical. Kettles and pumping equipment require space and are generally positioned away from building entry and exit points to help minimize disruption and to help ensure safety for everyone involved. Many contractors who own equipment have years of experience installing hot-asphalt systems and should be consulted in your decision. The durability and versatility of asphaltic roofing products extends through the many ways in which they may be installed. Properly installed multiple ply asphalt roofing systems can provide decades of weatherproofing protection for your building. As with any roofing system, selecting contractors who are familiar with and trained about the installation practices required of the membrane manufacturer will help to ensure a proper and long-lasting installation. No matter what challenges you face, asphaltic roofing has an installation solution that is right for your property. For more information about asphaltic roofing systems, visit asphaltroofing.org.